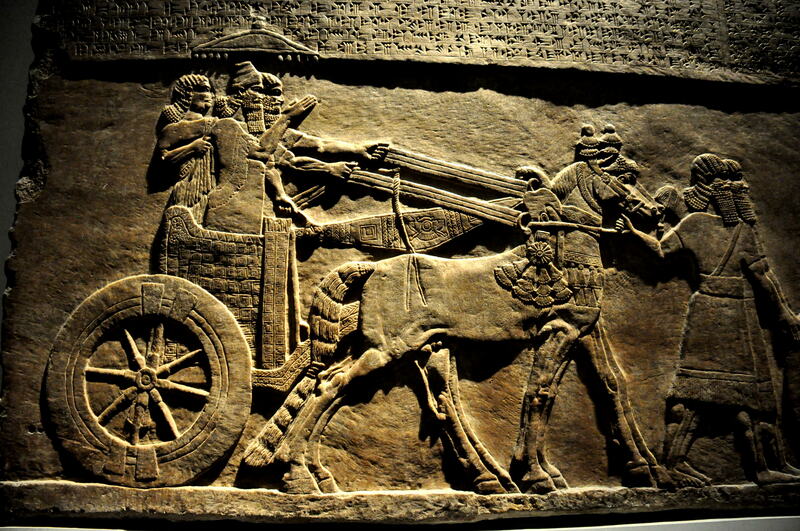 Above: alabaster panel from the palace of Tiglath-Pileser III. But this does not adequately account for all the information given in the gospels. All three synoptists are careful to note that the woman touches, not just his garment, but more specifically the hem of his garment. Why this detail? Why the woman decided to touch this specific part of Jesus’ garments is unknown. Was it simply because it was easily accessible to her touch, being low on his robe, or was it because she possibly knew that there is power in remembrance, power in the commandments, and power in obeying them. Perhaps she thought that of all places to touch on his clothing, these tassels, with their priestly blue threads, would be the closest thing to touching heaven. Thus we see that in both Aramaic and Akkadian, sister languages of Biblical Hebrew, the act of grasping the hem of the garment of a deity or king is a way of expressing one’s submission and loyalty to that person’s authority. I submit that this clarifies several things about the woman with the bleeding in the synoptic gospels. It explains why the hem (kraspedon) is mentioned specifically, even though contact with any part of Jesus’ garment might otherwise have sufficed for a “contact” for healing power to flow from him to the woman. Very likely many in the crowd were doing the same thing. It also explains why Jesus replies to the woman, “Daughter,your faith has made you well.Go in peace, and be healed of your affliction.” The question is sometimes asked, “Does this woman show the requisite sort of faith? Is she not merely trying to filch some power in order to be healed?” The answer is that her gesture of touching the hem of his garment is itself a pledge of loyalty, an acknowledgment of Jesus as messiah. This is very interesting. Thanks for posting! A friend and I were discussing this yesterday and he mentioned another possible implication of this: 1 Samuel 24 where David cuts off the “edge of Saul’s robe”. I always wondered why it bothered his conscience so much.. but maybe it’s the same symbolism (though inverted) going on here? Thoughts? Yes, I think you are right about that. It would be interesting to see if there are direct parallels in Akkadian to confirm. Prior to reading this article, I had always just related that episode to the very prominent theme of robes in 1 Samuel. Thanks very much for this post. I am always delighted to find out about insight from the historical/cultural environment of the Biblical writers that explains and enlightens their writings. I find that Kenneth E Bailey’s book: Jesus Through Middle Eastern Eyes : Cultural Studies in the Gospels (SPCK, 2008) does this for much in the gospels. Good stuff. But I think the tassels are still relevant. They were on the corners (or “wings”) of the garment. Jesus did have healing in his wings — for those who showed Him allegiance, of course.